Jerry & Marcy MonkmanChoosing the best winter tent for you will help ensure a good night’s sleep before a frosty hike. Spending a night outside in winter requires a different shelter than in warmer seasons. 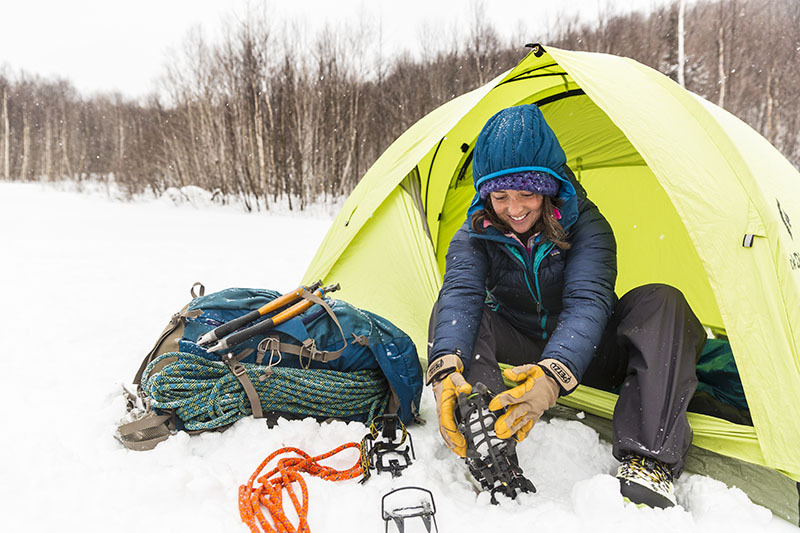 To stay safe and comfortable when the wind howls and the snow piles up, you’ll want to choose a tent that’s as tough as the conditions. But what makes a tent truly winter-worthy? A reliable four-season tent is built to withstand stiff winds, can support or shed heavy snowfall, and can be sealed up tight—both to keep warmth in and blowing snow out. They’re also sturdier than most three-season tents, with more points for tying guylines. Four-season tents come in three designs, each with its pros and cons. This is the classic design: an inner tent body covered by a separate rain fly. The main strength here is ventilation, with a breathable inner tent fabric that allows moisture to pass through and an outer fly that provides waterproof protection. The outer fly also makes it easier to have a large, covered vestibule in front of the door—a huge plus for storing gear or cooking in bad weather. As a general rule, the more times poles cross, the stronger the tent, and double-wall tent poles tend to cross multiple times. With mesh doors and wall panels that can be sealed for winter use or opened in milder conditions for better ventilation, double-wall tents are usually more versatile for warmer-weather camping. The big drawback of double-wall tents is their weight: A two-person model can tip the scales at 8 pounds or more, with so-called lightweight versions exceeding 6 pounds. Price-wise, expect to pay anywhere from $400 to $700 and up, depending on the model. Winter-specific single-wall tents feature one layer of specialized fabric that blocks snow and moisture from the outside yet allows water vapor to escape from the inside. Single-wall styles tend to be smaller and shorter than other options and feature fewer poles and pole crossings, but their steeper sides shed snow more easily and make up for the tent’s less rigid structure. These combined features reduce a single-wall tent’s weight. Many two-person models weigh less than 6 pounds, with a few weighing as little as 4 pounds, making these a hit with winter adventurers who like to travel light and fast. The downsides? Single-wall tents can cost a lot—$500 to $900 and up—and tend to perform poorly in milder conditions, when they become sweaty hot boxes. Resembling a teepee, these tents feature a pole supporting a single wall, with no floor. Despite their simple design, pyramid tents are surprisingly robust, with sloping walls capable of withstanding heavy winds and snow. While some models can be upgraded with an inner wall or floor, no floor offers the convenience of going in and out with your boots on. That means, of course, you’ll be setting up your sleeping pad directly on the snow. Pyramid tents tend to be roomier and stand higher than other winter options (a benefit if you’re tall), and covered vents at the apex provide good airflow. The simple design often keeps the weight and price down. On average, pyramid tents weigh roughly 3 to 5 pounds and cost between $200 and $400. Get our gear guru’s pick for the best snow stakes to keep you anchored this winter. Find a warm and comfy sleeping pad to match your winter tent. Read tips for hiking on ice.